I remember in 1982 the excitement of receiving a comics magazine from Yugoslavia. One panel inside jumped out at me straight away. What on Earth was an arresting portrait of British Eighties pop sensation Boy George, brilliantly captured in a style strongly influenced by French master Moebius, doing in this copy of Yu Strip magazine, which one of my generous correspondents had sent me? 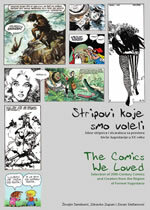 That same page, written as well as drawn by Zoran Janjetov, now shows up in the pages of this new guidebook, The Comics We Loved: Selection Of 20th Century Comics & Creators From The Region Of Former Yugoslavia. 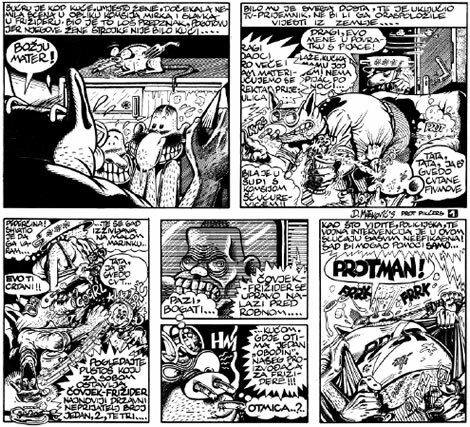 I was so struck by that panel that co-editor Peter Stanbury and I extracted it and ran it with a brief review with contact details in the third issue in 1983 of our new British comics culture magazine, Escape. I wonder if Boy George ever saw it? Back in the Eighties, I’d been aware for some time, thanks to my international contacts and meeting enthusiasts visiting London from abroad, of some of the treasures of Yugoslavia’s comics culture. You too may find some names here who are familiar from their work published in other countries. But this new reference work by Zivojin Tamburic, Zdravko Zupan and Zoran Stefanovic really blows the lid off of this treasure chest, brimming with a cornucopia of gems. Consulting with about 100 comics critics from the whole of the West Balkans, these three intrepid, discriminating compilers have realised an exceptional achievement in this book, by combing diligently through thousands of pages of comics and comics reviews to distill a captivating alphabet of some 400 artists and writers who have shaped and enhanced not only the comics of their homeland but in several cases the comics of the world. 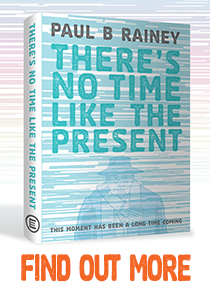 To read a summary, reviews and sample pages in English, take a look at the Omnibus Strip website. If I can single out here a few personal favourites who I have some familiarity with already, I am leaving dozens more for you to pick out for yourself. 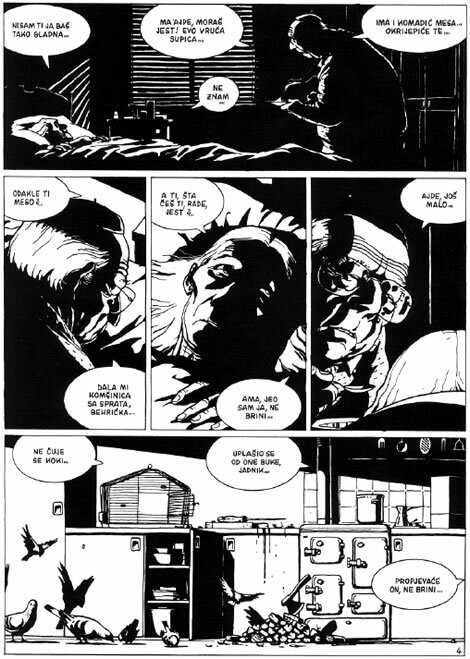 In terms of my exposure to them, I was reminded here of Mirko Ilic‘s striking, sophisticated sequences, a few of which had shown up in Heavy Metal and Epic magazines in the USA. I luxuriated once again in the delirious excesses of Dubravko Matakovic‘s Protman, working in the tradition of zany grotesqueries by the likes of Basil Wolverton, Ken Reid or Jacovitti. From their earliest evidence, Igor Kordey and the late, much-lamented Edvin Biukovic were clearly maestros in the making of heightened realism. I was also drawn to the powerful graphics of Danijel Zezelj, who like Kordey has gone on to success in American comic books. Tomaz Lavric made quite a splash with his Bosnian Fables when I discovered them in their French edition from Glénat at the Angoulême International Comics Festival. 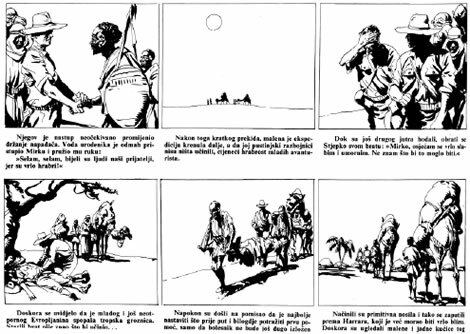 As for founding fathers of Yugoslav comics, various friends had alerted me to the compelling vitality of Andrija Maurovic‘s characters, whose emotions and presence seem to leap off the page. Seeing further examples here, I admire him all the more for his bold positioning of figures within nature, from storm-tossed seas to the stark desert landscapes, white with heat, sky and earth divided by horizons of one fragile line, akin to Hugo Pratt but decades earlier. It is just as hard to believe the virtuosity and diversity of output by Walter Neugebauer or Julio Radilovic as demonstrated here. I also closely follow the alternative scene wherever I can, so when Slab-o’-Concrete in Britain translated one of Wostok‘s albums, Daddy is So Far Away, We Must Find Him! 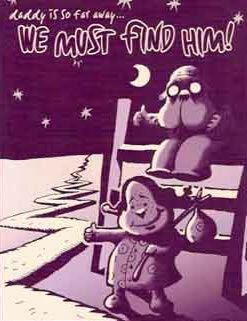 with Grabowski into English in 1998, it was the ticket for me into his wonderfully surreal universe. And of course Zograf‘s psychodramas, notably in Regards from Serbia, also translated initially from Slab-o’-Concrete, conveyed more powerfully than any regular news media the real traumas of the NATO bombings on Serbia. It was an honour and delight to invite him to London in 2004 for the Comica Festival. And then there are the revelations here, all these choice individual pages that give a glimpse of an artist’s talent. For example, I marvel at those 14 panels of Ivo Kusanic‘s eye-catching flow of compositions and almost calligraphic linework, or Dorde Lobacev‘s exquisite renderings adapting The Wizard of Oz. In artists like Dorde Milovic, Zeljko Pahek and Zoran Tucic, and plenty more between these covers, we have contemporary draughtsman of truly international calibre. And there lies one point - the overwhelmingly male dominance of the medium as evidenced here. The growing global significance of women creators on 21st century comics will hopefully be reflected in this region as well in the years to come. I am always fascinated with how the great innovators in comics, wherever they spring from, can go on to affect how the medium evolves around the world. While it is possible to spot the powerful external influences on several artists featured here, from the Disney funny animal school and the glamorous illustrative realism of Alex Raymond to the waves of Franco-Belgian masters from Hergé and Franquin to Giraud/Moebius and Bilal, the latter born in Yugoslavia himself, it is equally clear that many Yugoslav artists took these inspirations and developed their own distinctive approaches, and certain major talents here truly stand up as world-class innovators and remarkable visionaries. Even the more relatively derivative or genre-defined offerings here still entice me, because here are artists entertaining their audiences and making their own local variations on popular tropes and styles. The carefully selected samples in this survey make me long to read these creators’ whole stories and discover their full narrative impact and the evocation of their unique storyworlds. I am sure that this meticulously researched, lavishly illuminated reference work will help bring them much overdue and well-deserved attention. I hope that it will also encourage more of their comics to be respected and honoured as a major element of the former Yugoslavia’s literary and artistic heritage and current creative culture. I also hope that it will lead to more of these works being translated into various languages, so that they can become comics which more people around the world can come to love for themselves. 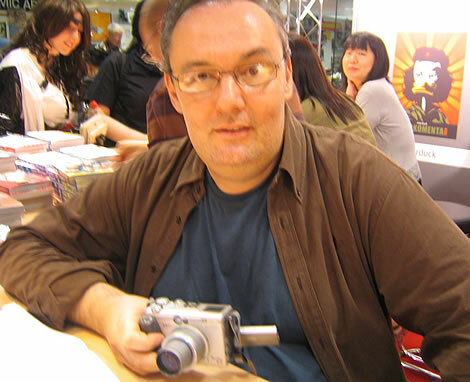 Photo of Zoran Janjetov when I finally met him at the Erlangen Salon 2008. As a true labour of love, only 500 copies of this handsome 312-page colour A4-size hardback have been printed. For those who don’t read Latin-alphabet Serbian, my foreword and the authors’ introduction also appear in English and for the information section for each entry the title and genre are translated. Particularly useful are the bi-lingual closing sections which spotlight 16 distinguished creators, comic magazines and comic books, and critical and historical books and magazines about comics. There is also a copious bibliography of periodicals, exhibitions (group and solo), festivals, websites, books of comics studies, daily newspapers, specialised cultural journals, and finally a full index of all the selected works. You can purchase copies directly from Zivojin Tamburic, who is based in London, for £35 by emailing him at z.tamburic[at]blueyonder.co.uk - he can also advise how to order from outside the UK. 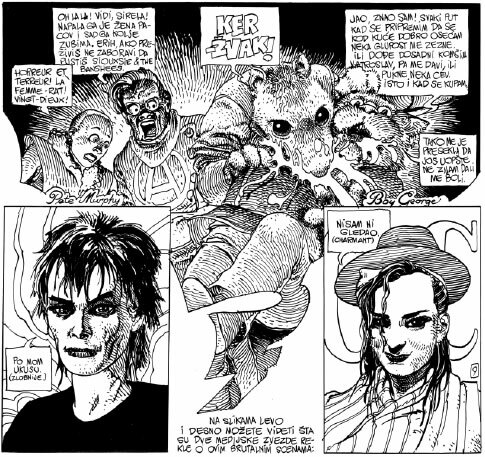 As a footnote, Zivojin Tamburic has helped me on my new book 1001 Comics You Must Read Before You Die out in October, by writing several entries about great works of comic art from this region. 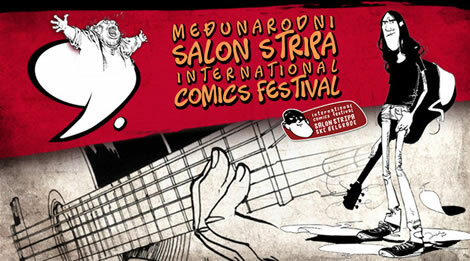 I am also delighted to be joining him at the end of September as a guest at Salon Stripa, the 9th Belgrade International Comics Festival, where I look forward to meeting local creators and enthusiasts and sharing our common passion for the 9th Art. 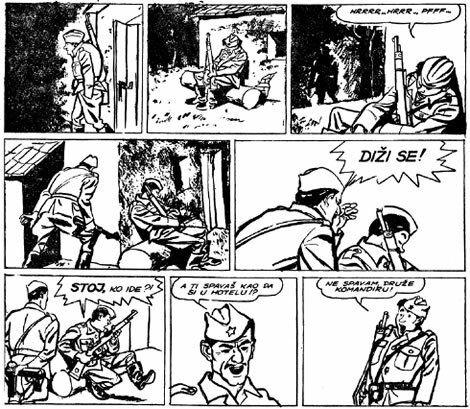 A version of this article is published in The Comics We Loved: Selection Of 20th Century Comics & Creators From The Region Of Former Yugoslavia by Zivojin Tamburi&cacute;, Zdravko Zupan & Zoran Stefanovi&cacute;.